There’s nothing more thrilling than the call of a month of literary abandon. Thousands of writers participate every year in National Novel Writing Month (NaNoWriMo) and many fine (or not so fine) stories have come from its exciting challenge. If you aren’t familiar, here’s the splash page. The basic gist though is that you write 50,000 words in 30 days. 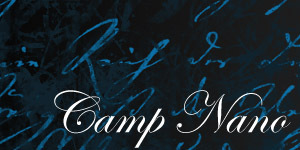 As a Working Writer with too much going on to change her socks regularly, I fully support NaNoWriMo, and I suggest you participate in one of the two Camps offered this year. Don’t tell me you weren’t thinking it. I know 50,000 words seems like an awful lot. I really do. But I’ve got a secret: It’s really only a solid hour to hour-and-a-half of honest to goodness writing a day. Which you should be doing anyway. The big prize for completing a round of Camp Nano is a 50,000 word novella, which is about 1,667 words a day. While regular Nano (the one in November) offers you door prizes for winning (also known as verifying you wrote 50k), Camp is just about the fun and excitement. With an average novel being around 80,000 words, Camp ends up giving you more than half of your average word count in 30 days. If you’ve plotted well, those 50k words can actually be mostly useful. But for those of you who hate plotting, Nano is known for the phase “No plot? No problem!” It was one of the original reasons I gave it a try. No one expects your words to be good, which is why Nano works. The thing is, if you hit 50k words or not, no one has to know but you. While part of the fun of these things is community, it can still be a very solo challenge. Saying that, I did actually sign up on the official site so that I could be held semi-accountable for my words. It does help, believe me. There are also hashtags for both #Campnano and #Campnanowrimo, as well as #Junowrimo (a privately run “nano-esque” June adventure that has been running for some time). There is also #wordmongering and #wordcount tags for posting your daily numbers. Folks run hourly word sprints and other fun contests on Twitter. It’s a great community event. But again, the idea here is no pressure. Getting a daily word count of 1,667 or higher will do wonders for your writing, but we’re Working Writers. An hour or hour-and-a-half of solid writing is pretty sketchy for us. Heck, I’ve been 2,000 words behind for two days, but I’m still plugging away. Give it a shot anyway. You might be pleasantly surprised with how productive you become. It even helps battle Burn Out! Trying something new can be hard and scary, but it can be very rewarding. Get out of your comfort box and try a month of literary abandon. You might find that you have more drive to write when you get back to the fun of just putting any old words on the page, instead of keeping a tightly organized structure. That’s what rewriting is for anyway, right? Join me over at Twitter as @DahnyaOch and let me know your wordcounts. I’ll be cheering for you! Have you tried Nanowrimo before? What are your thoughts on the month of literary abandon? Will you be giving it a go this summer? I’m quite the plotter myself. I’ve done Nanowrimo for four years and have never won because November sneaks up on me and beats me over the head. Pantsing is not my way, even though I give a pretty good run at it for a few days. I’ve had a lot of luck with CampNano, because I had been saving a story idea (one that was created based off a pantsing idea from last November’s failure!) and had already plotted it out. Your memory sounds absolutely wonderful, and is exactly the spirit of Nano! Thanks for stopping by!